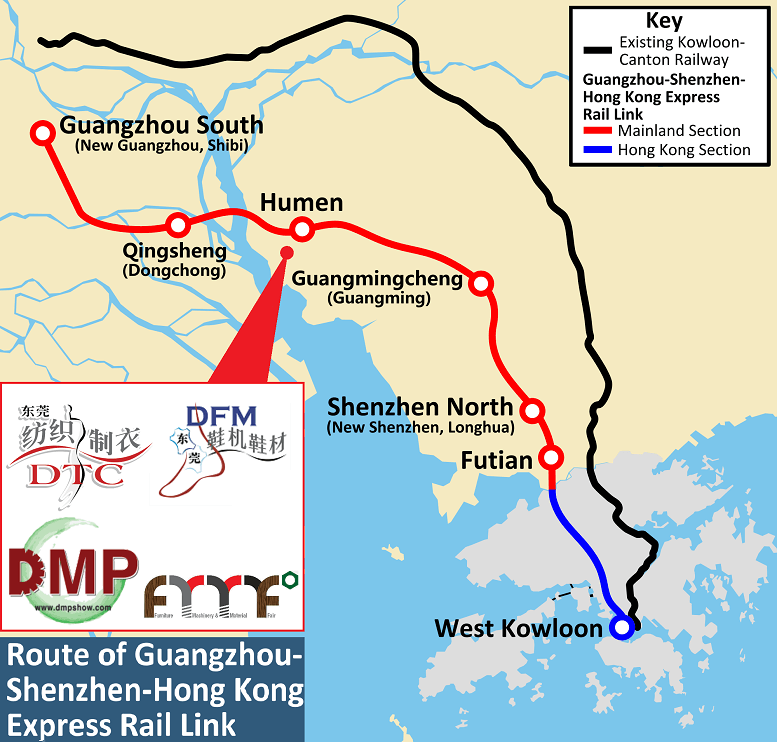 take the Guangzhou-Shenzhen-Hong Kong high-speed rail / Guangzhou-Shenzhen Railway (Harmony), interchange Dongguan Metro Line 2 to Exhibition Center Station, fast and convenient! Shenzhen (Express Railway) Futian Station → Shenzhenbei (Metro) → Shenzhenbei (Express Railway) to Shenzhen (Express Railway) → Humen Express Railway Station → Dongguan (Metro) : take line 2 and get off at Exhibition Center station. Guangzhou South Station → Qingsheng → Humen Express Railway Station → Dongguan (Metro) : take line 2 and get off at Exhibition Center station. ● Hong Kong West Kowloon Station → Humen Express Railway Station → Dongguan (Metro) : take line 2 and get off at Exhibition Center station. ● Guangzhou South Station to Humen Express Railway Station travel time: 17 mins, fare: RMB 35, half an hour interval. ● Then take a taxi (RMB 20, 10 mins travel time) or Dongguan (Metro): take line 2 and get off at Exhibition Center station, or number 67 / 107 / 118 / 118a / 213 / 310 / L1 / 219 bus to the Exhibition Center at Houjie. Hong Kong West Kowloon Station → Humen Express Railway Station → Dongguan (Metro) : take line 2 and get off at Exhibition Center station. (6:30～20:30; every 30 mins; RMB 35), then take a texi or railway to GDE. (6:30～20:30; every 30 mins; RMB 38), then take a texi or railway to GDE. (7:35～21:05; every 30 mins; RMB 45), then take a texi or railway to GDE. CTS Coach ¥60，from Huanggang 8:25, 9:25… every 1 hour. Fee: Up to HK$100; Journey Time: 3 hrs; drop-off at Sheraton Hotel, change taxi to exhibition center. The above information is for reference only. Please check with individual providers for the latest price and timing.